I once again need your help for something "extra-Bollywood"
As I am reading comics of my youth, , I find a strange word page#128, in the "Three wives of Superman"
Is"Limborang" fully spelled, or does it lack some letters? What could this device be? If "limborang" does have more letters in front of the "lim" then they ought to be shown in another panel. That is the way to "play fair" with the readers. No, I have not thought of a word it might be. Perhaps a brand name? P.S. Note that he presumes that he has authority to command her. He doesn't even say "please." Note also that she expresses a "feminine" reason for desiring super-power. Well maybe Superman is a Supermacho. But maybe also he's got human feelings such as fear (yes, it's paradoxal for the man of steel). Fear of losing Lois. So he has no time for politeness nor gallantry. Let's see the context: in this imaginary story, Superman and Lois get married. 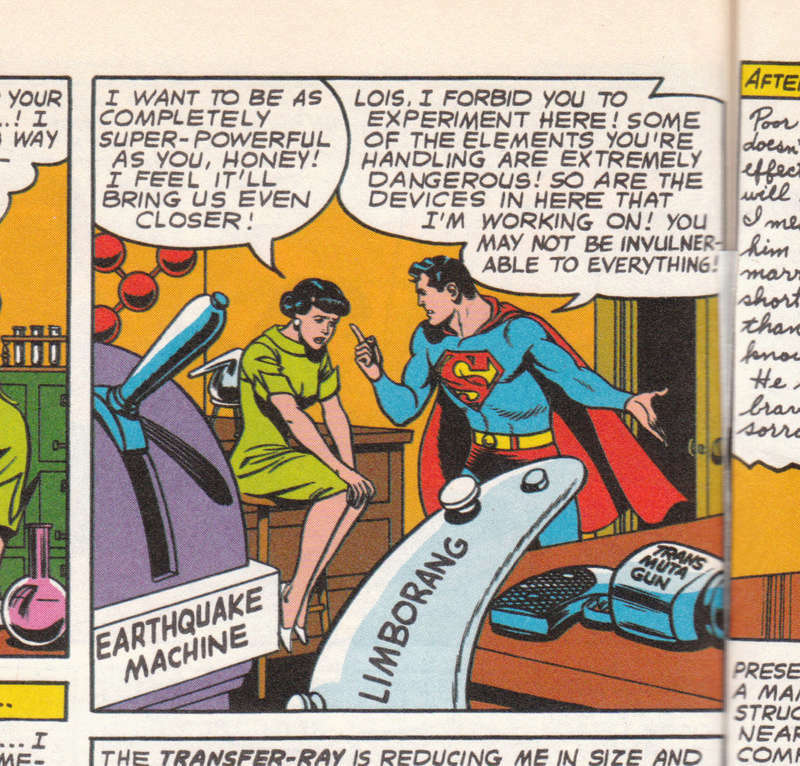 Superman creates a temporary serum that gives super-powers like his to Lois, except super-vision. That's why she enters the forbiden room, to try to create another serum. To prevent Superman from suffering, perhaps. If she is as strong as him, nothing (but Kryptonite or magic) can harm her. The curve suggests that it's a play on "boomerang": so some sort of weapon that you throw, and it comes back to you. "Limbo" might then either be a reference to limbo dancing, so it flies very low to the ground, or to a state of limbo, but it's not clear how that would be useful in a weapon. Hello MrB, I guess you're right, it must be a weapon that flies high in the limbo and comes back.